* ... LOCAL HOUSING: I heard from a few local Realtors after I posted an update on the local housing market. 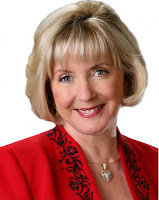 My own personal Realtor of choice is the hard-working Mary Christenson of Watson-Touchstone (pictured). She reported good buyer activity and reduced inventory, especially in homes under $400,000. She also noted the first time tax buyer credit ends April 30th and "buyers need to get offers accepted now in order to close by that date. I've had very good closing activity for sales generated in December during the last five weeks-by the end of February I will have closed a full 50 percent of my entire sales volume for last year!" Meanwhile, fellow Watson Realtor Katy Glentzer took me to task for citing the online real estate sales website Zillow in reporting slow sales in other markets. "We are not singing the housing Blues in Bakersfield," she said. "For the past several months our prices have increased. Yes, inventory is down, thanks to the banks wising up. Is there anything wrong with supply and demand? They are releasing foreclosures at a slower pace and actually helping owners through the short sale process." We'll keep an eye on the local market and my thanks to Mary and Katy for their input. * ... HEALTHY EATING: I received an interesting email from local writer Teresa Adamo about a new after school day-care snack at the Downtown School. Each child receives a bowl holding different fruit, all cut into chunks. The kids are each given a plastic glove to gather their chunks of choice, and a skewer for the creation of their fruit kabob. Said Teresa: "As you can imagine, it was a huge hit! 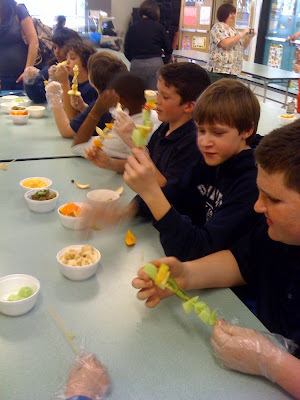 I saw happy kids making second kabobs because they enjoyed the process so much, not to mention the ingredients! The fruit choices included: oranges, bananas, cantaloupe, honeydew melon and kiwi. Of course, from a Mom's perspective, I saw the healthy value in this interactive snacking. With the alarming rates of childhood obesity -- not to mention the unknown, long-term affects & impact on health care -- this scene was at least a little reassuring." Someone from that school is thinking. * ... GAUCHO WORLD: I heard from two University of California at Santa Barbara graduates who wanted to give their alma mater a shout-out. Marciano Flores, activity director of the AVID program at East Bakersfield High School, wrote to say he was both a proud Gaucho and an East High Blade. Also weighing in was old friend and Gaucho grad Laura Wolfe, who is now working with the Arts Council of Kern after many years in development at Cal State Bakersfield. * ... CAR CLUB DONATION: Hats off to the Bakersfield Car Club and its annual Super Cruise show that was held at the Kern County Fairgrounds. Club member Roy Romagno told me the club raised more than $10,000 to benefit the the Society for Disabled Children of Kern County. Always nice to see local folks pitching it to help others during a difficult year. * ... BAKERSFIELDISM: Reader Bobbie Hulson offered this one. "You know you are from Bakersfield when even old people pick their parking spaces by how much shade there is, rather than how close they are to the door." And add this one: "Someone from out of town talks about how foggy it is and you tell them, 'just wait!'"